Hello again! Just popping to share a new favourite recipe, or should I say, a method of cooking potatoes on the fire. Carefully cut the potato into four wedges length-wise, keeping it together, as you are going push the quarters back together. Place the wedges in the middle of the tinfoil square, and draw the sides up around it to form a ‘cup’. Lightly bruise the rosemary with the back of a knife to release the flavour, and place it in the middle of the potato wedges; crush the garlic clove and add it in too. Grind over some salt and pepper, and then carefully pour about a tablespoon of olive oil over the wedges (or add the same amount of butter). Now carefully seal up the tinfoil packet, pushing the wedges back together, to make a ball. Bake on the grid above medium coals under soft enough to push a knife through, 30 to 45 minutes. Tips: try some variations on the seasoning, maybe just a sprinkle of mixed dried herbs or your favourite spice blend, or even just plain salt and pepper. 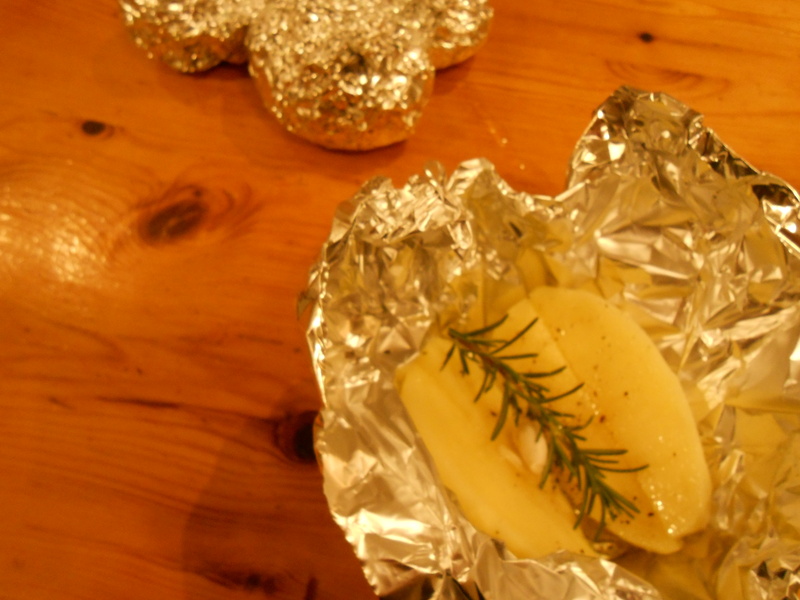 Be careful to wrap the tinfoil so that your olive oil doesn’t leak out, and don’t over-bake, as the potatoes will start to burn. This entry was posted in Campfire Recipes, Ideas for Salads and Vegetables and tagged campfire recipes, garlic, potatoes, rosemary. Bookmark the permalink. Your blog is looking lovely and what a great recipe to start with. My hubby also doesn’t like the skin on potatoes and likes his spuddies crispy. Have a lovely weekend ahead Linda.